Hidden deep beneath the earth is the lost civilization of Murania, ruled by the ruthless Queen Tika. When Gene Autry stumbles across the hidden city, the Muranians are determined to silence him and destroy his ranch to protect their secret world. The Queen’s masked army of thunder riders hunts down the singing cowboy and brings him to their subterranean city. Teeming with futuristic weaponry and machinery, the unfamiliar land resembles an alien planet. It looks like the last round-up for Gene when deadly robots attack him with flamethrowers. Autry’s daring and the Queen’s bloodlust escalates to a final confrontation which threatens the entire populace of Murania with total war. 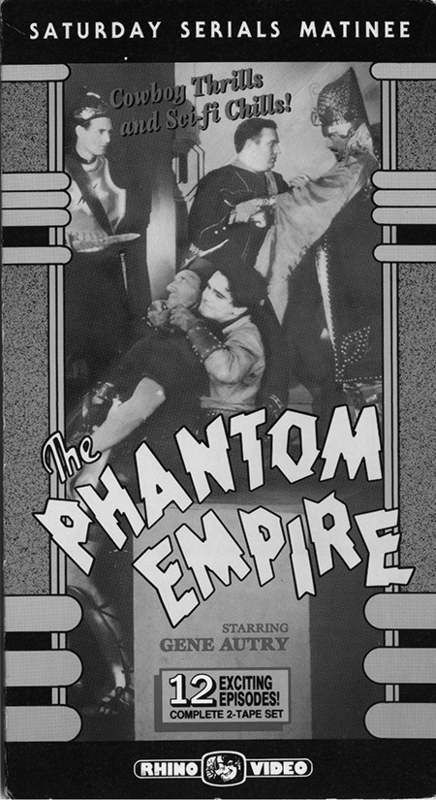 Cowboys, thunder riders dressed in quasi medieval armor shooting futuristic weapons, robots with flamethrowers— The Phantom Empire viewed genre boundaries as mere inconveniences rather than limits. And here’s the kicker: Scattered throughout the story, the singing cowboy would periodically have to have to show up at Radio Ranch to sing on his radio broadcast or the evil bankers were going to foreclose on his ranch. It was this dose of realism (defined by me at the time as anything that wasn’t fun) juxtaposed with the over-the-top fantasy elements that really caught my attention. I became fascinated with the idea of taking what was considered to be a low art form and creating something of substance within those confines, of trying to take what others considered junk and turning it into something more. That thought continued to inform my cartooning choices for the next fifty years. It’s hard to overestimate the impact that The Phantom Empire has had on my developing brain.